When someone is seriously injured and a lawsuit is filed to recover compensation for those injuries, one of many Florida personal injury laws will apply to the case. Substantive laws (negligence, premises liability, negligent security, etc.) and procedural laws govern how the case moves from filing to the moment when the jury comes back with its verdict (and thereafter in the appellate process). Florida court procedure is organized statewide. 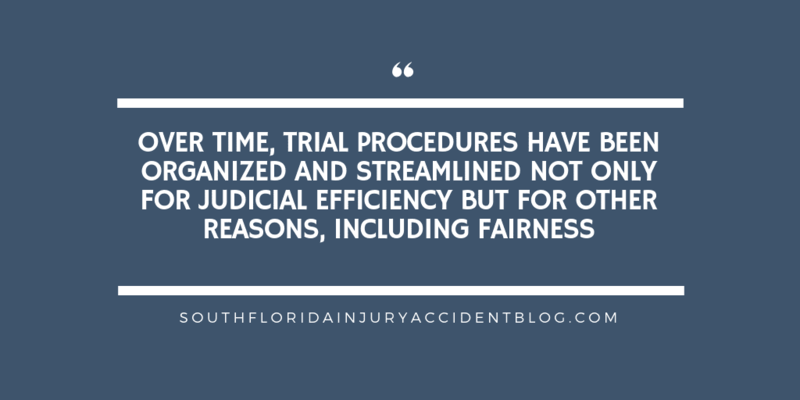 Over time, trial procedures have been organized and streamlined not only for judicial efficiency but for other reasons, including fairness. For example, a defendant in Tampa should expect to receive the same treatment by a jury as someone in Orlando or Key West. Accordingly, the Florida Supreme Court oversees the wording of the instructions given to Florida juries, which are published and provided to lower court judges and counsel after the High Court has determined the proper wording of these instructions (and after inviting commentary from anyone with an interest in doing so). Florida Jury Instructions are detailed and are sometimes complicated; however, one thing is clear – juries decide two main issues in a negligence case, liability and damages. The jury first decides whether or not the defendant is liable to the plaintiff. Then, if the defendant is found liable, the jury is then instructed to determine the amount and type of damages to award to the plaintiff. If your verdict is for (defendant), you will not consider the matter of damages. But if the greater weight of the evidence supports (claimant’s) claim, you should determine and write on the verdict form, in dollars, the total amount of [loss] [injury] [or] [damage] which the greater weight of the evidence shows will fairly and adequately compensate [him] [her] for [his] [her] [loss] [injury] [or] [damage], including any damages that (claimant) is reasonably certain to incur or experience in the future. You shall consider the following elements: …. Care and treatment of claimant: The reasonable [value] [or] [expense] of [hospitalization and] medical [and nursing] care and treatment necessarily or reasonably obtained by (claimant) in the past [or to be so obtained in the future]. When lost earnings or lost working time shown: [Any earnings] [Any working time] lost in the past [and any loss of ability to earn money in the future]. These jury instructions relate to general damages. However, there are other types of damages that may be awarded to a personal injury victim, e.g., punitive damages, wrongful death damages, and damages when the plaintiff is a minor child. No two personal injury trials are identical. What damages can be considered by a Florida jury and the amount of damages that can be assessed is different in every case — each case has its own legal issues to consider and fact patterns to analyze. Assessing the potential award in a case or reviewing the accuracy of an award already given needs careful analysis. A good piece of advice if you have been harmed in an accident due to the negligence of another party, is to speak with an experienced personal injury lawyer before you file a claim to learn about some of the issues that can arise with these claims, including the type of evidence needed to prove a claim and the type and amount of damages you can recover. Most personal injury lawyers, like Alan Sackrin, will offer a free initial consultation (over the phone or in person) to answer your questions.